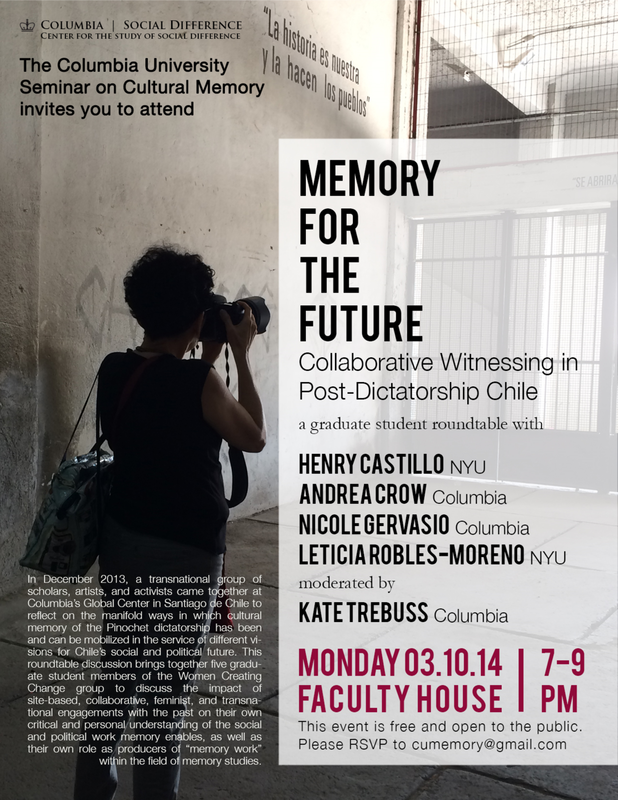 “Memory for the Future: Collaborative Witnessing in Post-Dictatorship Chile"
In December 2013, a transnational group of scholars, artists, and activists came together at Columbia’s Global Center in Santiago de Chile to reflect on the manifold ways in which cultural memory of the Pinochet dictatorship has been and can be mobilized in the service of different visions for Chile’s social and political future. This “workshop,” sponsored by Columbia University’s Center for the Study of Social Difference’s “Women Creating Change: Mobilizing Memory” project, incited all members of the group to think not only about the politics and performances of memory in Chile and beyond, but also about their own scholarly practices and methods for engaging with sites of memory and the complex connective histories of which such spaces are a part. This roundtable discussion brings together five graduate student members of the Women Creating Change group to discuss the impact of site-based, collaborative, feminist, and transnational engagements with the past on their own critical and personal understanding of the social and political work memory enables, as well as their own role as producers of “memory work” within the field of memory studies. Rachel Adams - "Parenting, Narrative, and our Genetic Futures"